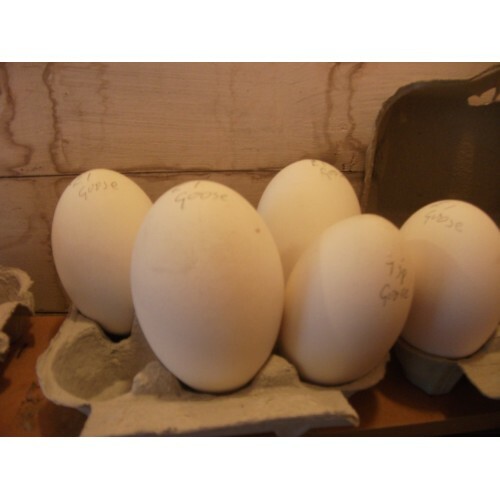 GOOSE EGGS FROM LARGE WHITE FARMYARD GEESE. GOOSE EGGS from a mixed flock of geese. All the eggs should be fertile but not guaranteed. £2.00 per egg I can only post 4 eggs for the way this site works out the postage. More eggs are here but a phone payment would be needed to have the correct postage. CUSTOM HATCHING AVAILABLE, GOSLING COST £9.00 EACH UNSEXED. We now accept payment by telephone using your credit or debit card, alternatively Bank Transfer, Cheque or Postal Order, normal payment on this site is Paypal but if you prefer another method then please phone or e mail to arrange payment.